A former Devon taxi driver's body has been mummified in a project to test the processes used 3,000 years ago. 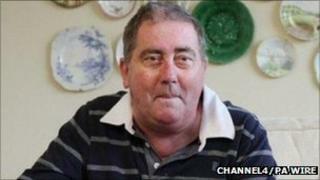 Alan Billis from Torquay died in January aged 61 after developing lung cancer. Mr Billis read a news story about a Channel 4 mummification project and decided to donate his body to the experiment after his death. His wife Jan said: "I'm the only woman in the country who's got a mummy for a husband." Dr Stephen Buckley, from the University of York, and archaeologist Dr Jo Fletcher used modern equipment to identify materials such as beeswax, oils and resins used in mummification by ancient Egyptians. Mr Billis's corpse was immersed in a salt bath for more than a month and his skin was covered in oils. The body was then wrapped in linen and after three months of drying, the process was judged to be complete. Mr Billis had said one of his prime motivations was his grandchildren. He had said: "Perhaps this would give them an insight into what their granddad was like, I don't know. "They'll most probably tell somebody at school that my grandad's a pharaoh. That's my legacy I suppose." Mrs Billis took it all in her stride, explaining: "He just said, 'I've just phoned someone up about being mummified'. "I thought, 'here we go again'. It's just the sort of thing you would expect him to do." Mr Billis's body will be kept at the Sheffield Medico-Legal Centre until the end of the year and it is hoped it will be used for further study into mummification and decomposition. Scientists believe the results may help in developing an alternative to formaldehyde in the preservation of tissue.